Getting separated from one's children is any parent's worst nightmare. But for refugees and migrants, that fear all too often becomes reality — especially in conflict zones where parents must fight hard to keep their children alive and by their side. Sadly, there are places in the world where children's lives are so hard that they feel they have no choice but to leave their parents and homes behind. Abdellah* (above) is one. Growing up poor in Eastern Ethiopia, the 15-year-old believed paradise lay just across the border and he was going to find it. Abdellah quickly found life in Djibouti far from idyllic. With no way to support himself, he lived on the street with no food or water. He soon fell ill, and if it weren’t for some other children who took him to Caritas, a UNICEF-supported day-time drop-in center for vulnerable children, there’s no telling where he would be now. As of early this year, UNICEF estimated that as many as 1,000 migrant and street children live in Djibouti’s urban areas, completely vulnerable to violence and abuse. The Caritas Center offers them — some as young as seven years old — a lifeline by providing social services as well as basic health and hygiene services, food and clothing. In partnership with UNICEF and the International Organization for Migration (IOM), Caritas also works to reunite unaccompanied or separated children like Abdellah with their families. The numbers of unaccompanied children are growing as a result of crises in Ethiopia and other parts of the world, prompting UNICEF’s call for stronger policies to keep children with their parents and swift action to reunite them if they get separated. According to the UNICEF report Beyond Borders: How to Make a Global Compacts on Migration and Refugees Work for Uprooted Children, those efforts are bearing fruit in Afghanistan, where 350,000 Afghans returned from Iran in the first 10 months of 2017. Moving home after failed migration is no small task for adults, but for Afghan unaccompanied children — most of whom are illiterate — the obstacles are far greater. The Afghan government has been working with local and international NGOs to reunify families and help children heal from the emotional distress they’ve suffered. To ensure their protection, unaccompanied children are met and registered by trained police officers at the border, then taken to a transit center in Herat, where they receive counseling and care. Once their families have been located, a social worker accompanies them home, passing the baton to a local case worker who stays in touch to help ease the child’s transition back into family life. From July 2016 to October 2017, the Afghan government and its partners reunited more than 3,000 children with their families. But children can’t be truly protected without addressing the desperate conditions that force them to flee home. In South Sudan, where the four-year civil war has caused massive displacement, over 17,000 children have been reported missing or have become separated from their families. UNICEF and partners formed a working group to reunite families in 2014. Since then, the group has reunited almost 5,400 children with their families using a secure communications system for the relay and verification of information needed to track family members across the country. Once children are matched with their family, UNICEF books their flights home. After two long years of surviving without their mother in a camp near Ethiopia, these children (above) are finally being reunited with their mother. 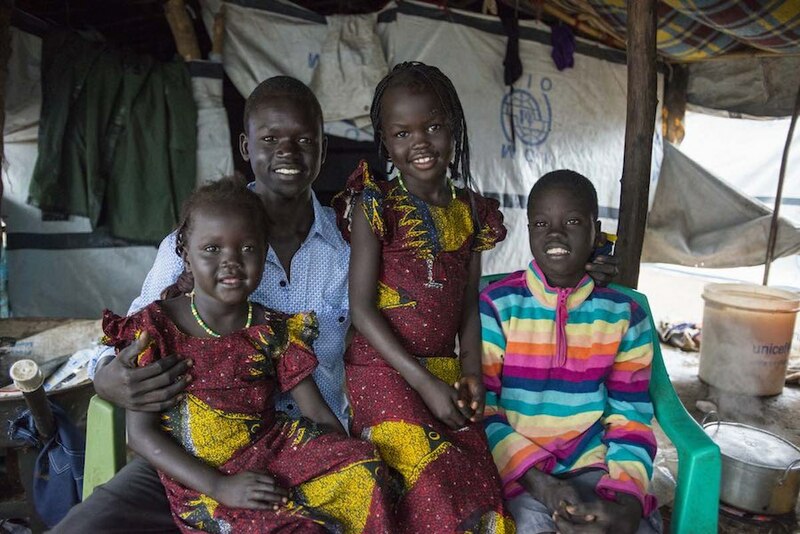 The last time the family was together, they were all at home in South Sudan when suddenly their village was attacked. Everyone ran for their lives, and in the chaos Bhang Wan, 15, and his siblings lost sight of their mother. A neighbor took them under her wing, and together they fled toward the Protection of Civilians (PoC) site in Bor to Akobo. The journey was difficult — especially because, without his wheelchair, Bhang’s brother Kerwan, then 8, had to be carried the entire way.